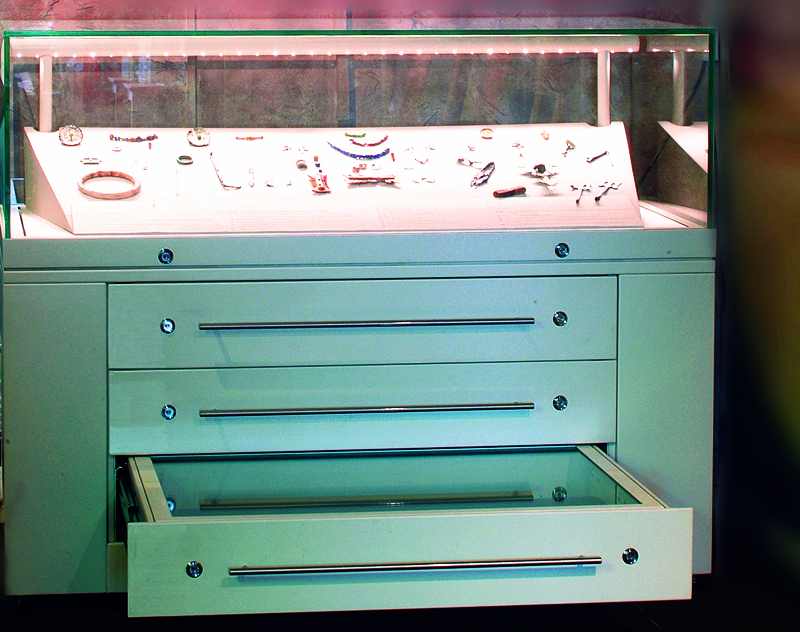 Table display case with drawer units is a combination of standard table display cases and drawer units.A full-vision glass hood with glazed panels for all sides provides all-vision display and lower drawer units with clear glass top to be built into lower plinth structure for high density display and ideal conservational storage for small and flat exhibits.This design is applicable to the batch exhibition of small,thin and flat artifacts such as jewelry,documents,coins,medals,manuscript,calligraphy and so on. 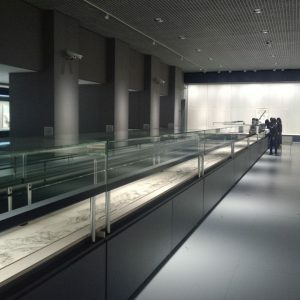 Glass hood to be built into lower table style of plinth with drawer units included,with display case sizes customized. Usually 5 glass sides of glass front/back/left/right/top for glass hood, or glass front/left/right/top but solid back, or sometimes glass top only.Non-glazed panes to be built by structural steel and structural ZF-MDF panels with fabric-wrapped dressing panels for interior dressing.In compliance with EN356-P4A, the glass are laminated with 4 layers high intensity PVB film interlayers between 2 glass panels.Low-iron ultra clear glass or imported anti-reflective glass with reflectivity less than 1% and light transmittance more than 97%.High fabrication precision and polished glass edge.Glass panes are frame-lessly bonded by clear neutral UV sealants. Drawer units with lockable glass top to be able to easily slide out and in via durable sliding system. Plinth to be built by low carbon square structural steel seamless zero-oxygen welding,with folded steel cladded externally.Enclosed plinth or cheek-plated plinth. External illumination or dimmable and protective lighting system such as LED light bar, LED light stalks or Fiber Optic light bar, and LED light strip for drawer units. Usually hinged glass hood with hydraulic struts support from sides or lift-up opening system.Motor-driven and wireless remote-control system for options. Lockable enclosed plinth for lockable facility box for silicon gel tray for passively-controlled RH 40%-60%, or discretely-installed electronic microclimate system for actively-controlled humidity 20%-80% and air purifying.